Flyslot has authorized Great Traditions (aka GTSLOTS) to run a North America race program for their LeMans Classic series of cars. Regional races are being scheduled, culminating in a North America Final race to be held on Saturday, June 13, 2015. The Finals will take place at Great Traditions, 831 Byberry Road, Philadelphia, PA. Track opens 8am, tech inspection starts at 10am, racing scheduled to start about noon. To qualify for the finals, you must finish in the top 4 of one of the 2015 Flyslot LeMans Classic regional races to be announced soon, or have a prior champion's exemption as a previous winner of a GTSLOTS championship final within the past 5 years. As they are introduced, newly released cars will be reviewed and added to the approved list if eligible. NOTE: This race series is for Flyslot manufactured cars, NOT cars manufactured by Fly. This will be a race series utilizing cars as supplied by Flyslot. Only those cars released by Flyslot and listed on the approved car list will be allowed. Only those replacement parts supplied by Flyslot or as listed in the rules below may used to replace parts. If the rules stated on these pages do not indicate a part or tuning method IS allowed, it is NOT allowed. Any variations to these rules must be approved in advance by GTSLOTS. All rules are subject to change. - As there has been a reported shortage of some parts for Flyslot cars at this time, the use of older “Fly” parts as replacement for damaged or broken “Flyslot” parts is allowed. However, the car body must be one of the cars that are on the approved car list and must have all of the parts in place (original or replacement) that came with the original “Flyslot” car except those parts listed in “The Body” section. Flyslot or any other manufacture’s 3/32” axles, axle stoppers, and bushings (no ball bearings) are allowed. Bushings may be glued in place. Front stub axles may be replaced with a single axle of the correct length, stub axles fabricated from a shortened axle and axle stopper, or equivalent. (Note: on the Chevron the front body post mount prevents the use of a single axle.) Axle shims are permitted. Stock front and rear wheels and/or any style (or color) C. B. Design wheels (front – 15mm x 8mm only/rear – 15mm x 11mm only) are allowed. Stock plastic wheels may be lightly sanded for the purposes of truing. Wheels may be painted. CA (Super) glue may be used to repair loose or attach plastic wheels. Flyslot stock or Slot.it tires may be used on the front. Front tires may be both glued and trued. All rear tires to be supplied by race host (Regional) or GTSLOTS (Regional and National) on race day unless otherwise noted. Note: some rear bushings may require the removal (or notching) of the bearing flange where it comes into contact with the motor can and will be permitted only in the sidewinder chassis cars for the proper seating and alignment of the motor in the rear motor pod assembly. “Quick Slicks” tire(s) #CB46 (.780”x.435”), #CB47 (.797”x.433”), #CB48 (.813”x.441), or #CB49 (.828”x.441”). Rear tires may extend past body by no more than .5mm. (.020”). No chemicals may be used on the tires. Tires are subject to change at the Nationals and due to availability some tire sizes may not be available. Regional hosts can determine tires to be used for their regional race. Only the Flyslot stock guide blade is allowed. Any manufacture braid and wire can be used and must be attached to the guide/braid through the use of Flyslot eyelets and may not be glued or soldered. Option 1 – Handout motors (GTSLOTS black endbell short can also known as the Piranha 21.5k – rated 21.5k @12volts) who’s price would be included in the race entry fee would be available for purchase from GTSLOTS (contact Rich at GTSLOTS or technical contacts shown below for pricing and availability) to the race host prior to the race date. Motors will be pre-tested and marked with an ID code (a report form can be supplied including motor test data); racers will provide their own pinion gears (12 or 8 tooth); trim the motor shafts as required; and will be responsible for the proper soldering of the lead wires to the motor tabs without overheating the tabs and causing damage to the motor. No chemicals (example: Voo Doo drops, etc.) shall be added to the motors. For the sole purpose to hold the motor in place, motors may ONLY be attached in place in the motor pod or chassis by using a single piece of tape supplied by the race host. Holes may be cut out of the tape to allow for cooling over the motor vent holes. Racers would receive their handout motor on arrival at the event, have the opportunity to test/practice with the handout motor before the start of competition, the option to purchase a replacement motor prior to the start of competition, and keep the motor(s) at the conclusion of the event. Only the provided handout (GTSLOTS black endbell short can also known as the Piranha 21.5k – rated 21.5k @12volts) motor is legal for the National event and will be supplied by GTSLOTS. Motors will be pre-tested and marked with an ID code; racers will provide their own pinion gears (12 or 8 tooth); trim the motor shafts as required; and will be responsible for the proper soldering of the lead wires to the motor tabs without overheating the tabs and causing damage to the motor. No chemicals (example: Voo Doo drops, etc.) shall be added to the motors. For the sole purpose to hold the motor in place, motors may ONLY be attached in place in the motor pod or chassis by using a single piece of tape supplied by the race host. Holes may be cut out of the tape to allow for cooling over the motor vent holes. Racers would receive their handout motor on arrival at the event, have the opportunity to test/practice with the handout motor before the start of competition, the option to purchase a replacement motor prior to the start of competition, and keep the motor(s) at the conclusion of the event. can the driver apply popcorn salt to the gears? During tech inspection there should be no evidence of applying a substance other than grease to the gears. So you can use it as long as you clean it off before tech. If the rules stated on these pages do not indicate a part or tuning method IS allowed, it is NOT allowed. Thanks Mike, hoping your schedule permits you and some of the racers in your area to come down to the finals in May. So no pizza grease,hand sanitizer, or toilet water either? Guess Dave won't be racing this year. I would like to have a NYC regional @ Mario's Raceway please. Also I'm kinda confused about what wheels are allowed is it only flyslot stock and C.B. Wheels only? Or can we run slot it wheels. Mario, we set the rules to either use the Flyslot stock wheels or the C.B. Design wheels so that the tires used on the rear wheels would be those designed for the Flyslot Classics cars. So basically no Slot.it wheels. Ok cool! But how do you use a flyslot stock wheels on the axle if wheels keep slipping off and you can't use flyslot stock axle cause the slot it inline gear won't fit the axle. So basically you saying purchase the CB Wheels am I correct? Or is there another solution? 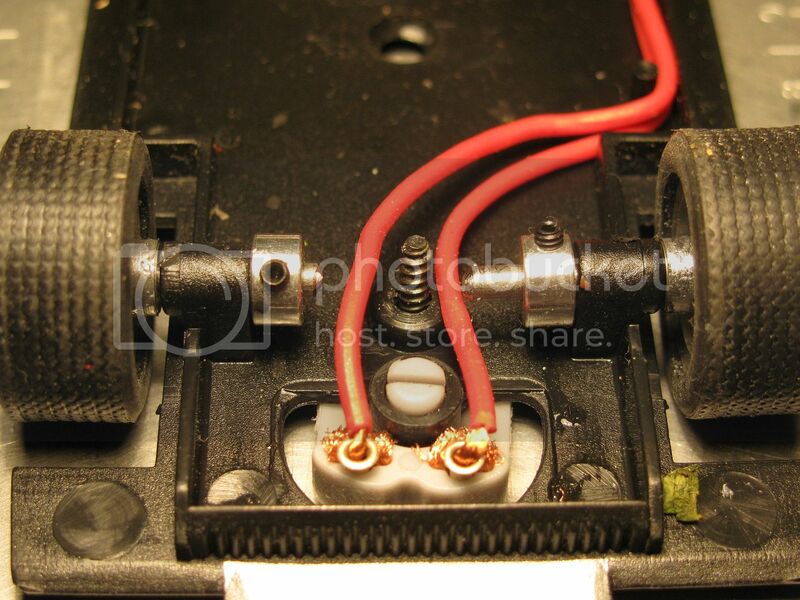 Mario, It is possible to glue the stock Flyslot wheels to a Slot.it axle, however if you wish to change your spur gear (inline or sidewinder) it's actually better to just replace the entire assembly with the Slot.it parts and the C.B. Design wheels. Usually the replacement wheels will also run truer and you will be able to space them better in relation to the chassis and body. The Fly Chevrons, and I assume the Flyslot versions as well, have the front body post in the way. As such, they cannot use a straight axle. Would replacing the stock setup with an improved independent setup be allowed? Such as something like this? This setup has a Slotit axle that has been cut, and then a couple of axle stops to hold it all together. As you can see by the screw in the center, there's no way to get a straight axle across there..
would like to know also as I'm building my Chevron right now. Someone also makes metal stub axle replacements...would they also be allowed?